Skating Squad is a brilliant starting point for a game with quite a bit of potential. Based around – you guessed it – skating, Skating Squad is a game where you skate through unique obstacle course-like stages while battling the clock and performing tricks. Overall the game is good. The 3D graphics are – though simple – well made and fit into the overall feel of the game very nicely. The game concept is simple and easy to follow, really there is nothing bad about this game… until you look really deep. 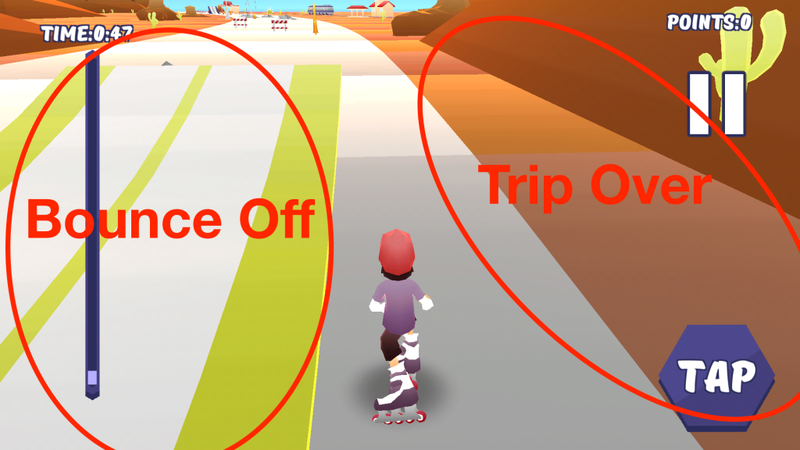 Though there are a few issues like the one above that when fixed would make the overall user experience much better, Skating Squad is a fast and fun game skating fans will love! How long have you been making Apps or Games? Gustavo Silveira brings 10 years of experience in developing digital games and joins product manager Luiz Verle with the mission of developing fun and uncomplicated mobile games for everyone. This is our first creation under Guilbi Studio name. We use Unity 3D engine and to create the art we work with PhotoShop and 3DS Max. Skating Squad is an exciting roller skating game that requires fast reflexes and swiftness from the player. Its intuitive interface enables you to use just one button to change directions, jump off ramps, perform several different maneuvers, grind rails and collect presents. There are 30 different tracks divided into three worlds: Desert, City and Park. Each track has it’s own missions, a mandatory one plus two optional untimed ones, that can be accomplished to earn extra points and improve your skills. Every maneuver earns you points that can be exchanged for new characters, skates and accessories. There are 6 unique characters, each with 3 exclusive customizations, plus 18 different skates to choose from. The game can be played in English or Portuguese, and is available only for Android devices at the moment, with an iOS version release scheduled for next month. This is the first game made by the Brazilian studio Guilbi, created by two friends whose goal is to produce fun and uncomplicated mobile games for all ages.